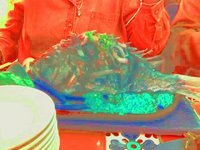 Cooking without a Net: Who Knew It Was a Neon Fish? Well, this is the picture that Mary took of my Big Fish on Saturday night. She used her phone camera and then e-mailed it to me and something has gotten a little lost in the translation. My shirt should be denim blue and the fish should be, well, fish colored. Actually, this makes a really pretty picture but it can be a little hard on the eyes. That bright glob of chartreuse to your left (right by the fish's head) is some of the best guacamole in the city of Chicago. This is the famous fried red snapper that El Barco is known for. I hadn't intended to order it. I ordered the red snapper with ajo and cilantro. 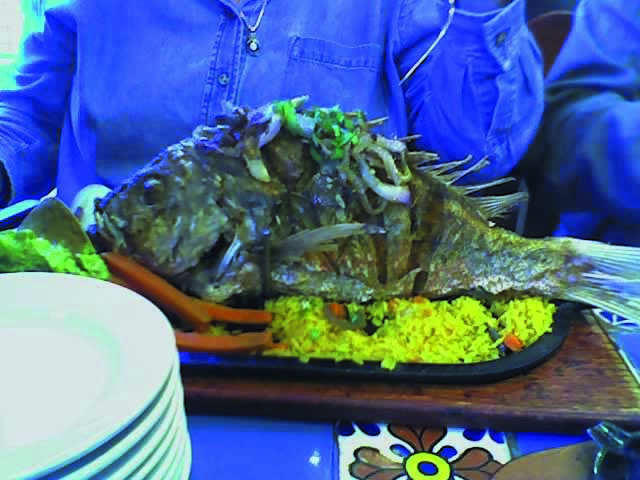 I was picturing grilled, even though I know this restaurant is famous for bringing a big ol' fried fish, head, tails and all, to your table on a comal that is the size of one-fourth of the table. About ten minutes after we'd ordered, I realized I was going to get the whole enchilada, so to speak. Which was ok by me. The fish was delicious, and not at all greasy. You can't tell from the picture, but the body is scored on both sides so it's easy to pull the meat off in manageable chunks. The Spanish rice (the aquaeous substance that's glowing under the fish on the lower right) was so-so, but there was some grilled zucchini and new potatotes that were pretty tasty. My only complaint--the fish doesn't come with the refried beans that are so good because they probably have lard in them and I would not ordinarily eat them but they're so good here I would definitely have eaten them if they'd come with my fish but they didn't but Mary didn't eat hers and was gracious enough to let me stick my fork in her plate every now and then. Mary had the carne asada and snow crab legs and she said it was good. I had a little taste of the crab and it was delicious. Our other two dining companions had chili rellenos and ceviche, both also good. I'm glad I had the fish; I think it's something everyone should do once (unless, like Mary, you don't care for fish, in which case you're excused). But next time I think I'll go for the steak again.